The interview with Suze took place Wed. June 13, 2007 my class presentation was the next day. So I really needed this interview to work out personally for me and for my class (mostly for me). The beginning of that week when I came from class I walked straight down 5th ave looked around H&M for something chic, cute and comfortable and (nothing white or black) just in case I had to do some running around. But anyway I bought this cream/off white baby doll top for $49.90 pretty expensive for me but for this cause was a major exception. I also brought black long earrings for about $7.00, another exception. My ultimate favorite purchase was these black peep-toe heels I brought at Daffy's for $32.oo, the shoes are 4 inches high but are so comfortable I walked ten New York City blocks in them no problem. And the jeans are vintage Parasuco jeans. The picture to the left is not of best quality this was after the interview. Okay the major part of this video interview was purchasing a video camera. I am not hip with what's the newest digital camera there is on the market so when I went to Best Buy a sales woman who worked in the camera area I made her know what exactly I wanted, a digital video camera that can be connected to my computer so I can edit the footage. The concept which I thought was clear became slightly difficult for this saleswoman which lead me to return the first camera and buy another camera that was a slightly higher in price. The night before the interview I was trying to get a feel for the camera and understand some of the functions. Probably one of my major regret of the interview is that the video is somewhat grainy and dark. As I reached in the Conde Nast building that morning I was cautiously looking around if I noticed any particular faces, regardless of that many of the workers or various magazine staffers dressed extremely effortless chic. I didn't see anyone with thigh high Chanel leather boots, some of the young ladies were in cute summer dresses and designer bags. One of my minor embarassing moments was when I was waiting in line to get check-in a man that was behind me informed me that my price tag was hanging from my back, totally embarassed. I snatched the tag so quickly and told the nice man, "thank you". After I got the okay I was given my Vistor name tag and was told to head to the 16th floor. 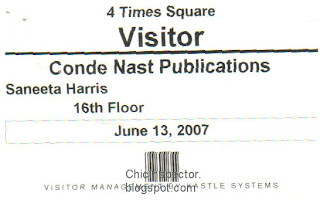 What was such a fascination for me was when I stepped on to the elevator and saw some of the Conde Nast publications had their own floor. Teen Vogue and Allure (i believe) shared the same floor; no one got off there, Lucky had its own floor; someone got off there, Vogue had it's own floor; no one got off there. I can't remember the rest. As I mentioned before Suze was so helpful and sweet when I was with her. My favorite was when I told her what some of my fellow students already did for their presentations it was her idea for the first part of the video when I introduced myself and the ending when I concluded. Also what I enjoyed the most was when Suze took the camera and went around the Glamour office and talked to some of the staffers. In this video you will see Ashley Baker, the blogger for Slaves to Fashion and was associate editor, style now has been promoted to fashion features editor according to Fashionweekdaily.com. Even though she is sitting down she is extremely tall with long vivacious red hair. Honestly everyone was so pleasant and sweet. I really had a great time meeting Suze and the rest of the Glamour staff. Thanks again Suze.